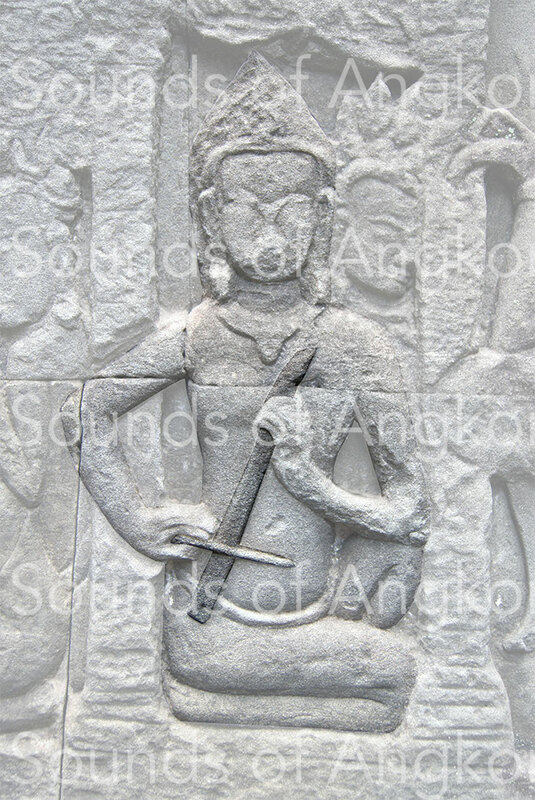 Scraper - Site de soundsofangkor ! 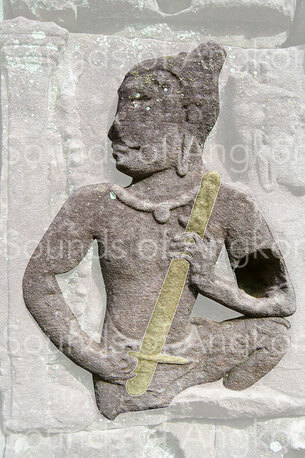 In the course of our research, the scraper was the most difficult instrument to identify. It still exists in Cambodia but it is now little used. We propose in opposite a reconstruction that combines a Khmer and a Vietnamese influence. If, in photo 1, the stick holding the right hand can be confused with a bow without hair, but images 2 and 3 have a stick too short to make its function plausible. Of the three right-hand positions, none corresponds to a known bow, particularly the position 1. In addition, on the latter, the bow does not rub the string perpendicularly, which is inconceivable in practice. The three instruments are represented in the same position, held with the left hand, at an angle of about 30°, without resting either on the ground or on the thigh and without apparent fixation. Now, in such a position, it is impossible to play such a fiddle. In pictures A, B, C, the base of the instrument is trapped between the toes. In the case where a buccal resonator consisting of a wire connecting the base of the instrument to the mouth would have existed, the position of the head of the musician of the bas-relief 3 does not conform. In addition, the bow is too high to let pass the cord that conducts the sound to the mouth. Accrediting the thesis of a fiddle without resonator neither physical nor buccal is unrealistic acoustically because the sound emitted is just audible. Recall that the buccal resonator fiddle is a court of love instrument whose objective is to bring the two protagonists closer together. In image 1, there are deep grooves, visible at the top and bottom of the instrument, more rare in the center because damaged. They are like a scraper. As regards dance music, it is not excluded to think that such a tool would have its place to mark the rhythm. A. Player of buccal resonator fiddle. J'rai. Vietnam. B. Player of buccal resonator fiddle. Bahnar. Vietnam. C. Player of buccal resonator fiddle. Kreung. Cambodia. 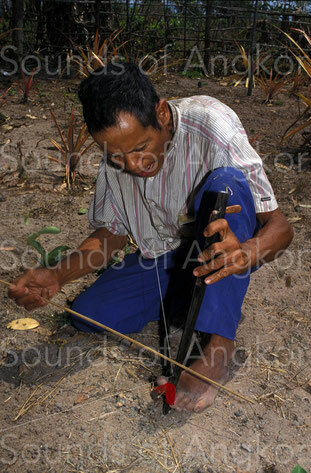 We know that the Angkorian instruments are predominantly of Indian origin. Now, there is no mouth resonating fiddle in the classical iconography of India. On the other hand, the scraper belongs to its well. 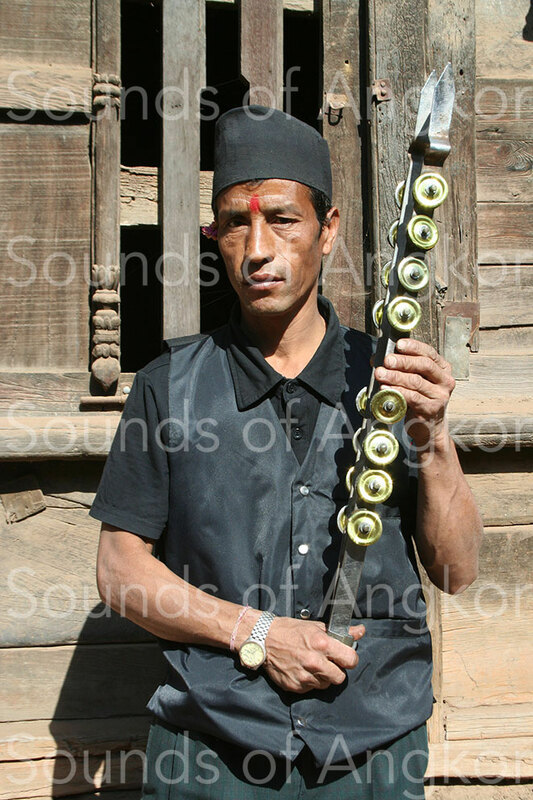 We found in Nepal an instrument that could be similar to this one. These are two steel blades on which are attached small jingles. To play, the musician enters the two blades and makes a back and forth motion to rotate and clash the cymbals. It is certainly a different instrument but the playing technique belongs to the same alternative movement. 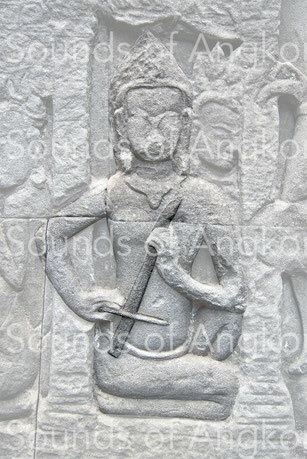 A real scraper exists in the instrumentarium of the Kinh of Vietnam, the sinh tiền. It consist of three small boards. The longest one has, at its extremity, a point furnished with a few coins (former currency pierced in its center). A second, shorter, has two nails on which are also threaded coins. A hinge placed opposite to the coins unites these two boards. The third independent plank has, on its anterior edge, asperities in the form of teeth-to-saw. 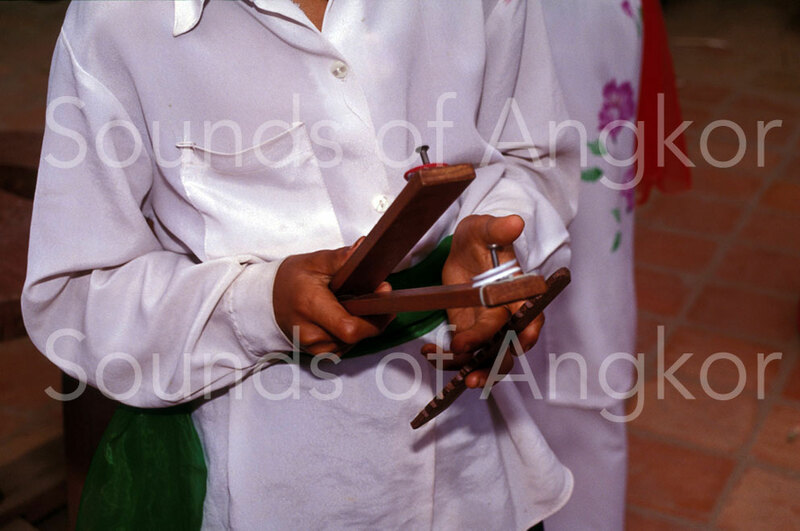 In order to play, the musician holds the wooden boards 1 and 2 in such a way that the weight of the coins of the longest board naturally drags him downwards. This same hand acts as a lever to raise this board and strike it against that of the top. With the other hand, with the toothed board, the player rubs the edges of the wooden boards in the manner of a bow. The pieces collide and vibrate. Formerly the musicians used this scraper to accompany the singers at the court of the emperor. 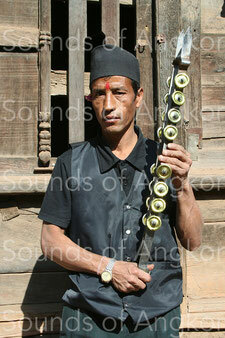 Today they are used by traditional musicians and dancers and during religious processions. A Khmer version also exists a scraper named krap chmol. 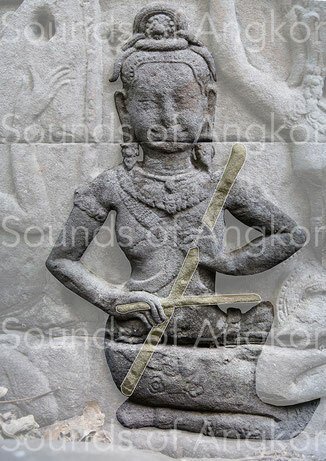 The ancient Khmer instrument is associated with the playing of the harp in cases 1 and 3. In case 2, the sculptor made the choice of this minimalist representation because of lack of place it seems. A person whose head can be seen behind could be the harpist. The orchestra is associated with dancers. 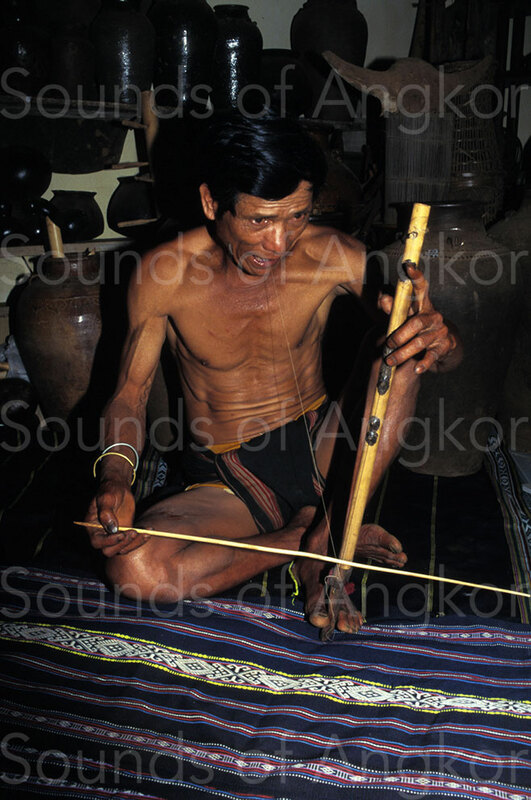 In the pre-Angkorian period, in the donation lists of the Lolei temple, there is talk of an instrument called chko played by "string players". It is practiced during the clear weeks alternating with the trisarī played the dark weeks. Having exhausted all the possibilities offered by the Indian, Khmer and Cham iconography, this instrument could be either a scraper or a wooden clapper similar to those still existing today in Thailand and Cambodia. The onomatopoeic character of the word would reinforce this hypothesis. In addition, the female player is called Can Cān. It is perhaps a nickname related to the practice of his instrument as is the case for singers. According to Saveros Pou, this term indicates the redoubling of something. It could be the back and forth of the hand on the scraper. But this is only a hypothesis. Another hypothesis could be a known instrument in Thailand under the name of phuang krap (กรับพวง), a small hand percussion consisting of a wad of fine slats of hardwood and brass, tied together at one end. This percussion can be akin to the scraper. Nepal. Vietnamese sinh tiền, both scraper and rattle. A fourth bas-relief reinforces our thesis. The musician stands. The stick with which he scratches his instrument is short and the angle formed by the two elements is incompatible with a game of a fiddle. The two protuberances at the top of the instrument could represent metallic noisemakers as they exist on the contemporary scrapers of Southeast Asia.